This months Builder of The Month we are proud to present to Gwyn Perrett (Westozy) for his work and dedication to the simbuild. Gwyn has now won this award for the second time. The last time he was awarded BOM was in Jan 2007. Over the last 3 years, there has been further improvements to his 737 Project. 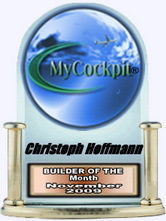 This months Builder of The Month i'm proud to present to Christoph Hoffmann for his work and dedication to the simbuild. I have asked Christoph many questions to which i'd like to thank him for such fantastic detailed answers. Click to read the full interview here. It is my pleasure to announce the return of builder of the month Steve Andrew. 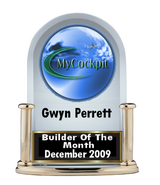 The builder of the month (or BOM as commonly referred to) is an award for just one of our members for a display of a selection of attributes i look for in a worthy candidate which include, simbuilding progress, quality, helpfullness in and around the forum to name a few. Another month and a new builder of the month Chris Danker. This month we bring together another experienced builder who interestingly also has real world experience in the aviation industry. Sit back and enjoy this edition of Builder of the month. Welcome to May 2009's edition of Builder of the Month. This month we bring you an unique Builder of the Month, Tony Hill. This one is not into building the usual Airbus or Boeing but a Fighter Jet. Interesting!! MyCockpit is pleased to announce Rodney Stagner as April 2009's Builder of the Month. I would like to thank Rodney for talking with me and allowing us to have a look into his 727 simulator build. It is with great pleasure that I announce Eric Tomlin as our first Builder of the Month for 2009. A great simulator and a great interview. Congratulations Eric.